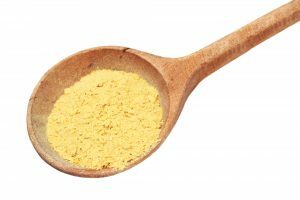 Nutritional yeast is grown from fungi, it is inactive yeast made from sugarcane and beet molasses. In the scientific form saccharomyces cerevisiae, or sugar-eating fungus, yeast cells use the sugar for energy. This yeast is yellow in color and comes in flake, granules or a powder-like form. People use it as a condiment because of the numerous health benefits and flavor. It is rich in B vitamins, provides a complete source of protein (providing 9 grams per serving), folates, thiamine, niacin, selenium, zinc, and riboflavin. It is gluten free, has no added sugar, is low in sodium, has no preservatives and is low fat. It is great for vegans who tend to be low in B vitamins. It is safe to consume as much as you want. You cannot use as traditional yeast for baking bread etc. It can be used in baking for very short periods, like the recipe below. It is mostly to be used as a condiment. Put the kale in a bowl with the olive oil. Massage the kale with the olive oil until the kale feels a bit softer. Mix in the nutritional yeast, red pepper flakes, curry and garlic powder. Spread evenly on your baking sheet and bake for 8 minutes. If they aren’t crisp, put them back in for 1-2 minutes.